Today saw us leaving flat Switzerland and heading up the switchbacks into real Switzerland. As we began to see the miles between us and Varese rapidly reduce, there was (and still is), of course, one large remaining challenge, the Alps. We started the day in the pouring rain in Langenbruck, and made our way to Luzern in record time thanks to the fact that the bad weather made us 100% antisocial and determined to reach our destination as soon as humanly possible. Things cleared up as we reached Luzern for a quick bite and we then headed up the hills, where we were met at the end (in Hasliberg) by Luke’s parents, who kindly filled us with raclette, crepe suzette and beer. Tomorrow we are heading into the mountain passes, most of which are closed due to snow, and we’ll just have to see where and how far we end up. 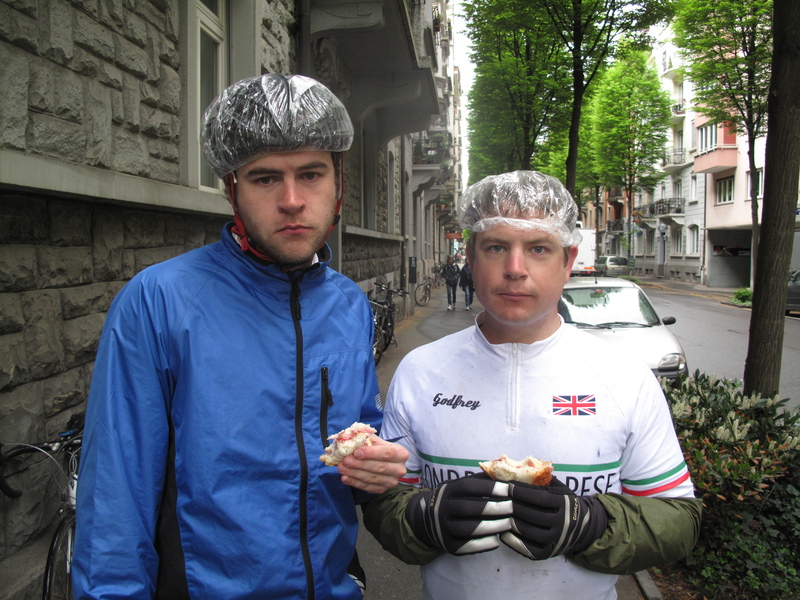 In the meantime, here are some photos of (1) Tim and Edd trying to keep their heads dry whilst having lunch in Luzern, and (2) an obligatory Alpine scene (with a lingering hint of our wish for better weather). enjoy the Alps, it will be hard, but valuable.